You can find tipico lunches everywhere — but where on Panama’s Azuero Peninsula do you go for an elegant mid-day dining experience? One choice in Chitre stands out. Every once in a while I like to take time out in the middle of my day for a nice restaurant lunch. Back in Florida I had my favorite spots — a little French patisserie that makes the best spinach quiche I’ve ever had, for example. Here in Las Tablas there are plenty of places to eat tipico — chicken or beef, rice, beans and maybe a fried plantain. But for a relaxed, sit-down lunch with some variety, the La Huaca Restaurante at the Hotel Gran Azuero in Chitre is the place to go. You can order off the extensive menu. Or — and this has been my choice every time I’ve visited — you can select their Menu Ejecutivo. The “executive” menu is available on weekdays until 3 PM. For a set price of $6.50 you get soup with a roll, an entree with a fancy rice and another side and a sweet fried plantain, and dessert. Recently my husband and I went there to celebrate my birthday. 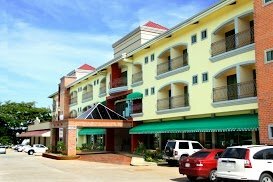 The hotel is located on the Paseo Enrique Geenzier, one of Chitre’s main roads, not far from the movie theater and the Paseo Central Mall. 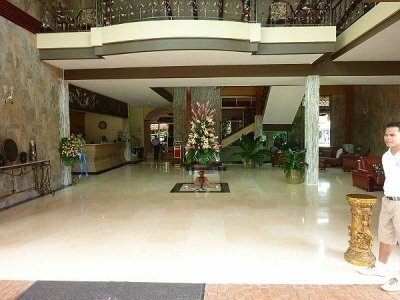 It’s a long building with an elegant, open lobby featuring high-ceilings and marble floors. The restaurant is well appointed, with views out over the pool area along one side and a charming little inner courtyard along another. An enormous flower arrangement graces one corner of the bar. I love iced tea. Here they froth it up somehow, and serve it in fancy glasses. It’s very, very sweet — Panamanian restaurants don’t do unsweet tea. The day’s executive menu began with a beefy soup containing big chunks of meat and potato and a small roll. For the main course we enjoyed a chicken parmesan. Rice is always one of the sides, but here they find interesting ways to dress it up. At this meal, kernels of corn were mixed with the rice. There was also a vegetable medley including broccoli, carrots, and mushroom slices. Another time when I lunched here with a friend, the main course included a very tasty homemade ravioli. Every time I’ve visited the rice has been prepared differently. 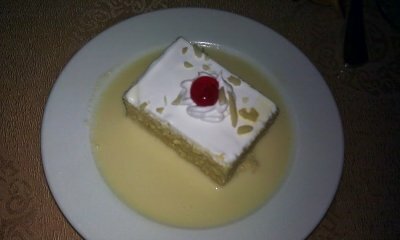 Dessert was a popular cake called tres leches (three milks). Other times they’ve served flan or cheesecake. Price for the full lunch, with iced teas, for two: $17.60. Lovely Suzanna! Love your blogs here! If I was to expat to Panama, I believe I admire what The qualities of Azuero towns the most. Glad to hear simple elegance one/while is not out of possibility there, and things that fit an expat’s budget to splurge on occasionally! Curious, do you get up Santiago way often as well; what so you think of that city? What’s Macaracas like? Would Santiago, David, or Peonome make perhaps good/better springboards into the Azuero area perhaps for newcomers…….than directly intoto Pedasi, Las Tablas or Chitre’? Mike, it’s all a matter of taste and the only way to find out what’s best for you is to get your boots on the ground. Although David has nothing to do with the Azuero. We came directly to Las Tablas. We have friends here who came to Las Tablas, then moved down to Pedasi, and now they’ve moved even farther down the peninsula. We’re considering going the other way, closer to Panama City. We still like Las Tablas — a lot — but think we might like to be closer to city amenities. Since we’re renting we’re not tied down. I understand. I think that renting would be the way to go as well, until a couple REALLY get’s feet planted and adopts the country. Just looking for additional wisdom about places near the Azuero (realize no direct relation to) with more amenities for just arrivals; to springboard from & into less populated areas when more comfortable. Hi! I love your blog. Thanks for the recommendation in Chitre. My wife and I live in Guarare and go to Chitre often for groceries and other thing, so we will have to check it out for a nice meal some time. Dont remember how I found your blog but I have been following it for a month or so. Any reccomendations for restaurants in Las Tablas. We have discovered El Caseron and the other pizza place on the square which we also like. Love all the info on the mobile working lifestyle too. I’m hoping to get more into that in the near future. Thanks! Hi Justin, If you like pizza you need to check out Kasa 21 in Las Tablas. It’s not easy to find, but it’s always busy because it consistently has the best pizza in town. Another place we like is the TerraMar. 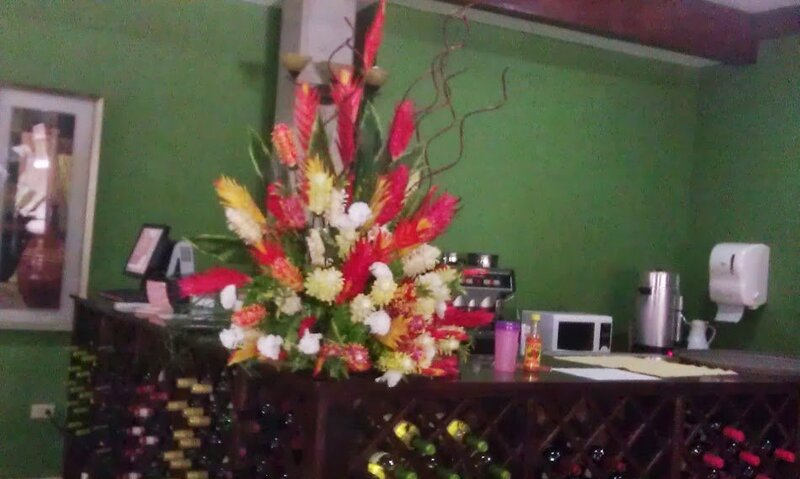 Thanks so much for your suggestion we will be sure to try Kasa 21 next time we’re in Las Tablas. I love pizza!! Aloha in here too Suzanne: I have put this is my list of Restaurants to go to in Chitre and the Kasa 21 for Pizza in Las Tablas. I was sorry to hear you are planning to move out of the Las Tablas area and further up North. I wonder when this move will take place and how far you will be going. I was hoping to get to communicate with you and also to meet you (and your husband) when we arrive in Nov. When do you anticipate the move? Hope you will have time to coorespond with me via e mail between now and when we arrive in Nov. as I have a few questions that need that personal touch that the consulate, American Airlines or a real estate company, just can not give. When 1 we are going to rent. 2 are bringing 3 Pedigree Golden Retrievers and a Cat and 3 It’s all NEW to me!!! Oh yes! So please do write if you will. My wife and I tried the Hotel Gran Azuero today for lunch. It was excelente, just as described. Superb food, top-notch service, attractive ambience, and good value for the price. We also enjoyed the lemonade, which is a delicious lemon ice. Thanks for the recommendation. We will be back there when in Chitre.